A PENSIONER who claimed he had been “cheated” out of £600 by a furniture retailer has gone viral after staging a one-man protest outside the store. He then stood outside the firm’s store in Longwell Green retail park, Bristol, apparently watched over by his wife from a nearby M&S. Among those to ask the OAP “how” was Lee Kelly, who posted a picture of the protester and his story to social media. 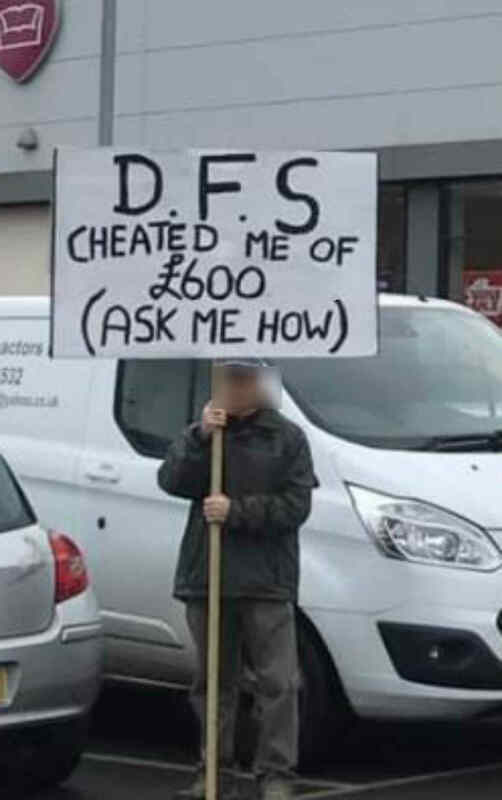 The resulting furore forced DFS to back down and refund the disputed £600, although they questioned Lee’s version of the dispute. Lee posted on Saturday: “He chose a brown leather sofa and it wasn’t all leather only the working surfaces ie, seat and top of arms, so he wanted the sofa to be completely leather and agreed to pay an extra £600. “When the sofa was delivered and in the house, he then realised It was only half leather and faux leather, he had paid the £600 extra and still didn’t get a full leather sofa. Also the seat has sagged in 1 Week. Lee added: “The guy is 70 years of age and has said he doesn’t want to be doing this at his age, his wife is worried he will get in trouble and watches from M&S. The post received over 19,000 likes and 11,000 comments from Facebook users who were outraged with the furniture retailer. Speaking today, Lee confirmed that he has been in contact with the man involved and says the issue has been resolved. He said: “DFS have given him the full £600 and taken the old couch back so the customer is happy it’s been resolved. DFS confirmed on their Facebook page on Sunday that the issue had been dealt with. A statement said: “We’ve been made aware of an issue this weekend regarding one of our customers and a leather sofa that he was unhappy with. A spokeswoman for DFS said today: “We are extremely sorry that the customer in question was dissatisfied with his order, and that he felt the product he received didn’t meet his expectations. “We take any such issue very seriously, and having spoken with the customer, have resolved the issue to his satisfaction. “The Facebook post related to this issue wasn’t written by the customer, but by a passer-by who didn’t have full sight of the details of the issue. “The customer in question did receive a 100% leather sofa, but was raising an issue from a misunderstanding of what the leather upgrade he purchased entailed.